More than 24 family businesses in the United States. employ 62 percent of America's workforce. But these families have problems ordinary businesses don't; they know if they don't keep the family on track, the business will derail. 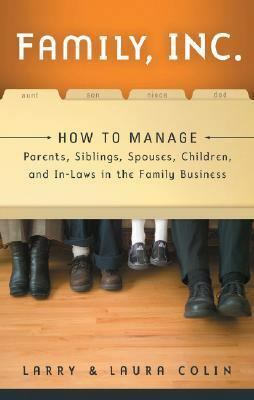 Family, Inc. is a witty, engaging blueprint for maintaining peace within the family without busting the business. The authors use characters straight out of real life to provide uncommon insights mixed with commonsense solutions. After all, they know that firing Uncle Bill is a bit more traumatic than firing just any Bill.Colin, Larry is the author of 'Family Inc.', published 2008 under ISBN 9781564149855 and ISBN 1564149854. Loading marketplace prices 5 copies from $7.46 How does the rental process work?